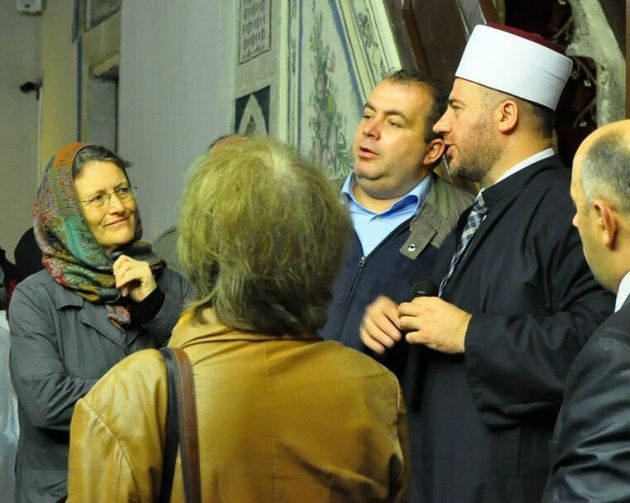 (Photo: Church and Peace / Annemarie Müller, Dresden)Christians and Muslims talk at a meeting convended by Church and Peace n Pristina, Kosovo in Ocoter 2015. The people of Kosovo got some good news when the EU and Kosovo signed an agreement on 27 October to deepen ties. The move is seen as a first step towards Kosovar membership in the European Union, which the tiny State's government is seeking. Unemployment and corruption blight the lives of the people in Kosovo, an economically poor nation seeking to rebuild its society after war upended its people's lives at the turn of the 21st century. This state is not fully recognized internationally. As they continue with the peace-building process, many of the nation's 1.9 million people feel let down by their fellow Europeans. More than 15 years since the war of 1999 and 11 years after the riots of 2004, about 90 people from 13 European countries met in Kosovo from 7 to 11 October as participants in an international conference of Church and Peace. The conference theme was, "'The fruit of righteousness will be peace' (Is 32:17) - living together at the heart of Europe". The invitation to attend the gathering came from the International Protestant Evangelical Church's "Fellowship of the Lord's People" in Pristina. "The war was long, and planned with a lot of money," one Kosovar told Church and Peace members. The Kosovar noted, "The work of reconciliation and reconstruction is supposed to take only a few years," yet this citizen was not hopeful it will succeed. A spokesperson for Church and Peace said, "It is therefore irresponsible if European institutions stop supporting projects too soon. The reconstruction of society is being torpedoed by corruption at all levels." "Young people, in particular, expressed disappointment about the lack of assertiveness and solidarity of European countries. They felt excluded by being refused visas to travel. Young people who have no prospects become vulnerable to religious and ethnic fanaticism." The worldwide ecumenical Pilgrimage of Justice and Peace led Christians, drawn from European peace churches initiatives and communities to the heart of Europe, to points of pain and places of hope in and near Kosovo. A pilgrimage from Budapest to Pristina went backwards along the route of the refugees who have fled wars and hardship, refugees who are travelling via Serbia to northern Europe. The people in Kosovo need more encounters and better prospects, according to Church and Peace. Landlocked Kosovo was a part of the former Yugoslavia. Its population is overwhelmingly Muslim, with about 4 per cent Christians who are for the most part Orthodox and Catholics. Periodic tensions have arisen between the majority Albanian Kosovar population and the tiny Serbian ethnic minority. Kosovo is a disputed territory and partially recognized state in Southeastern Europe that declared its independence from Serbia in February 2008 as the Republic of Kosovo. Serbia has not recognized Kosovo's independence but in August signed crucial pacts to normalize ties, a condition for its own accession to the EU. Those attending the Church and Peace meeting noted Kosovo's cultural and scenic beauties, yet they could also see the consequences of the war of 1999 and the riots of 2004. "It became clear that there is an urgent need for assistance with reconstruction," said a Church and Peace representative after the consultation. They contributed to this by "Singing and praying for reconciliation and peace on the site of the Battle of Kosovo (1389), the historical starting point for tensions and violent clashes lasting into the recent past." Then there was "Dona Nobis Pacem' (Grant us Peace) together with a monk and an imam in the Serbian Orthodox monastery of Decani, which is guarded by KFOR troops; a warm welcome in a mosque and in the neighbouring Episcopal church in Prizren - these were further way -stations on this route." KFOR (the Kosovo Force) is a NATO peacekeeping force of 4,000 troops operating in Kosovo under a UN Security Council resolution. "In view of the large percentage of young people and the depressingly high unemployment, not to speak of the hopeless situation of ethnic minorities such as the Roma," the Church and Peace gathering "offered a sign of hope to meet with the staff of social service and inter-ethnic projects." "Children from Roma families are supported beyond their basic necessities, e.g. they are given assistance with their homework. That is a way of reaching their mothers as well and breaking the generation-long chain of insufficient schooling," concluded Church and Peace.